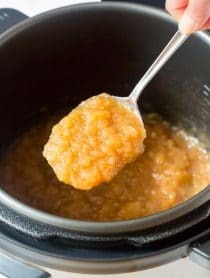 Skinny Chinese Orange Chicken Recipe – Bold tangy-sweet chicken simmered in a light and healthy sauce. 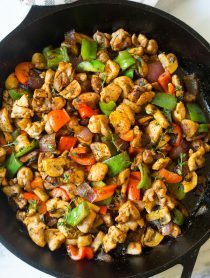 A gluten free Chinese take-out favorite you can feel good about serving your family! 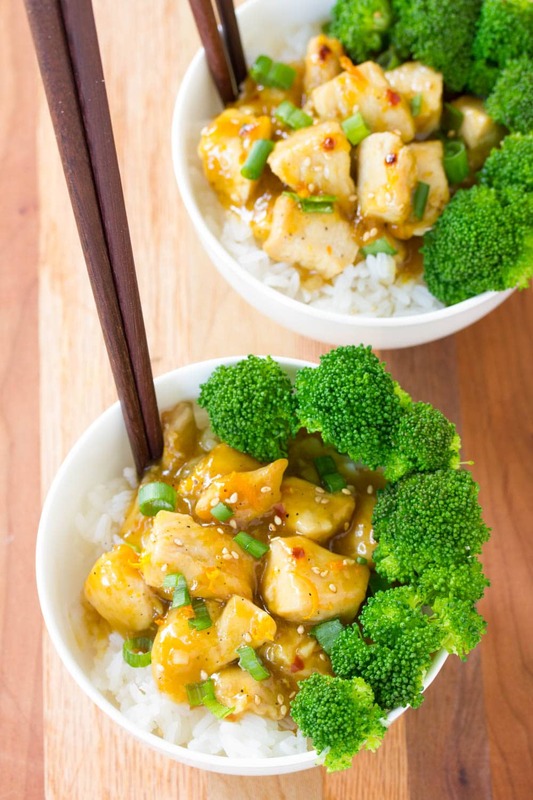 Today’s Skinny Chinese Orange Chicken is so quick and easy to make, you won’t hesitate to add it to your diner menu repertoire. You can shave off some prep time (and carbs) by skipping the breading on the chicken. Trust me, the dazzling sweet and zesty orange sauce will make you forget the tender chunks of chicken are not breaded. I have to admit that, in the past, orange chicken has never been a menu item that caught my attention. I usually lean to more savory choices. However, this Skinny Chinese Orange Chicken has changed my mind about sweet stir fry. 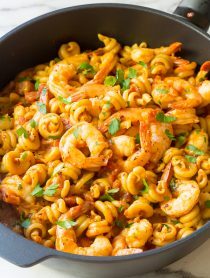 Its bright intense flavors will perk up your meal, and quite possibly your day! 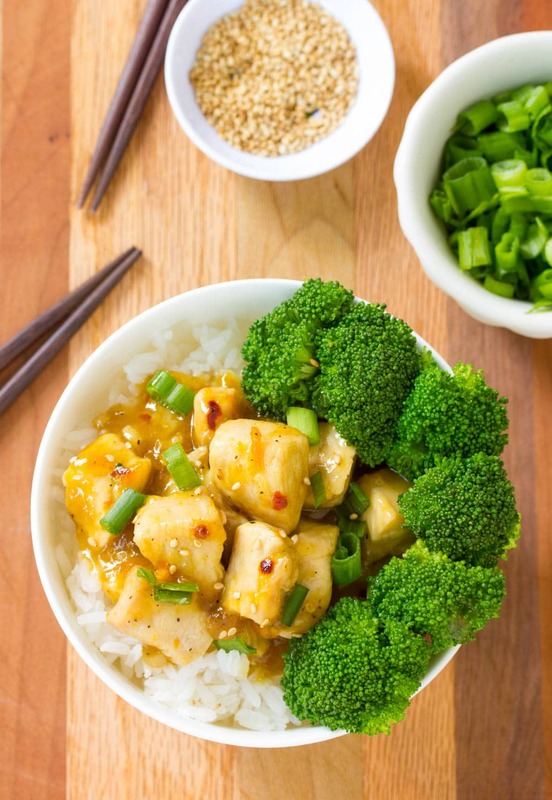 The simplicity of Skinny Chinese Orange Chicken is part of its charm. You will appreciate the ease of throwing this dish together. It only takes a few steps to achieve satisfying fare. Then throw the sauce right on top of the chicken and simmer until thickened. What could be more straight forward? 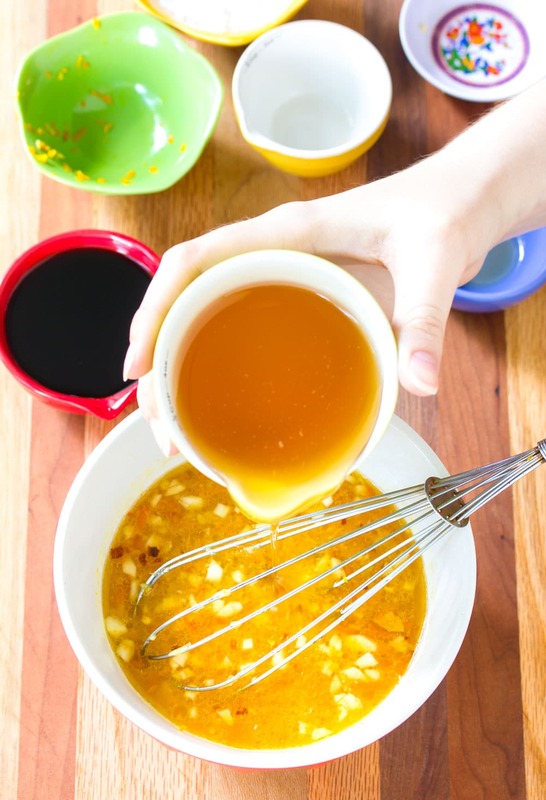 The sauce is bursting with the fresh flavors of orange, honey, ginger, garlic, plus a kick of red pepper. You can serve it over rice, with a side of your favorite vegetable, and call it a done deal. Or skip the rice and serve it with low carb cauliflower rice! 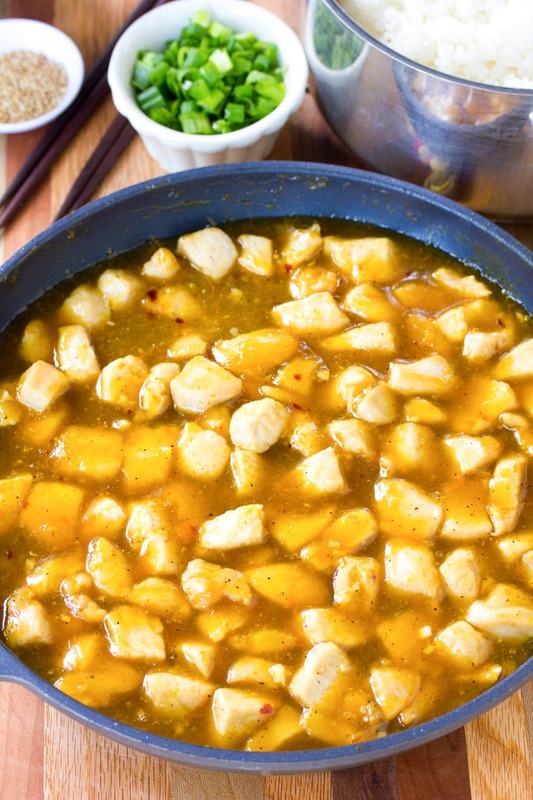 My family loves this Skinny Chinese Orange Chicken recipe so much that I served it three times in a week and a half, and they got excited about it each and every time. Secretly, I kept hoping there would be leftovers for another meal, but the kids ate it up for breakfast the next morning. I really can’t blame them, it is absolutely that good. Breakfast is a meal after all. Right? 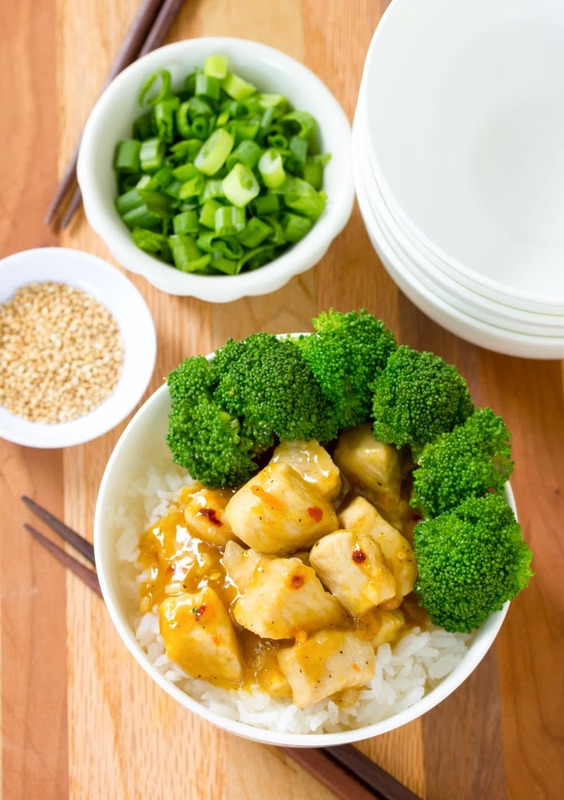 So no matter what time of day you choose to enjoy Skinny Chinese Orange Chicken, you will love it. Preheat a large skillet over medium heat and add the coconut oil. Salt and pepper the chicken pieces generously. Then sauté the chicken in coconut oil until cooked through, about 5 minutes. 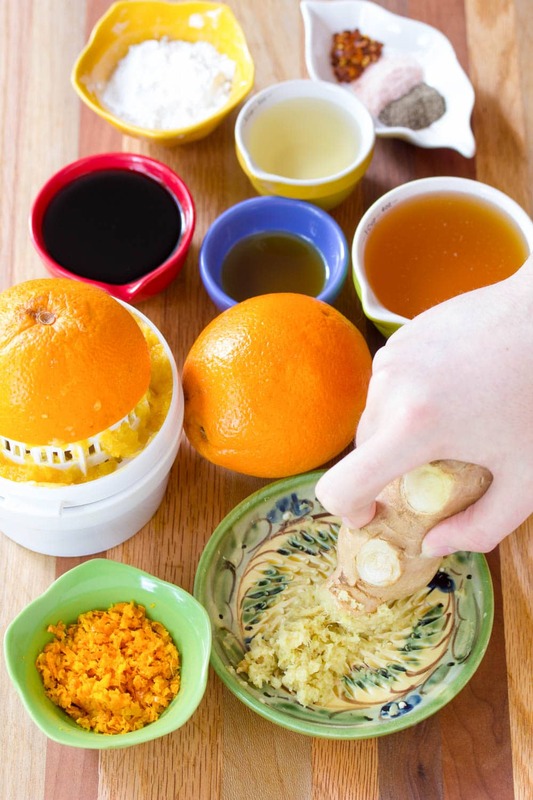 Stir in the orange sauce and bring to a boil. Simmer another couple of minutes until the sauce thickens. Serve warm over rice with your favorite veggies. For lower carbs, try serving with cauliflower rice. Thank you so much for this recipe, April! 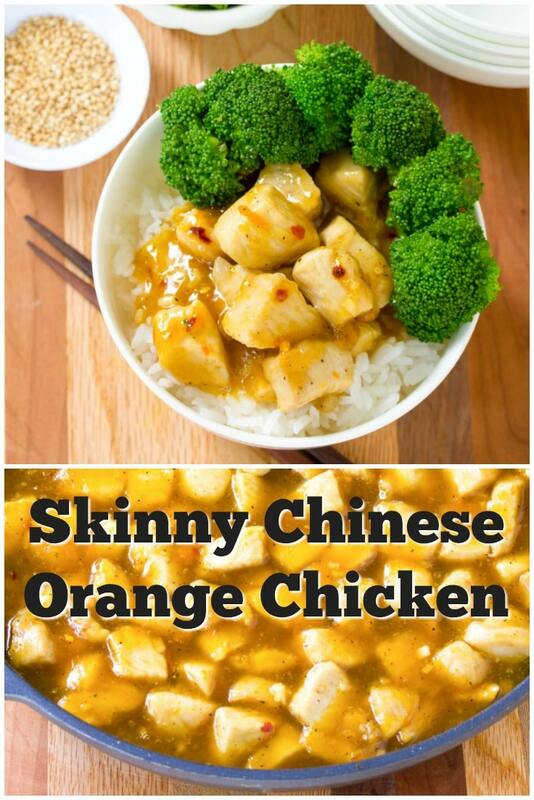 This Skinny Orange Chicken was amazing! My entire family loved it and we’ve agreed it’s going on our weekly menu rotation. This is the first homemade Asian dish I’ve ever attempted and it turned out to be perfect. I’ve been intimidated by the complexity and unfamiliar ingredients of some Asian recipes, so I really appreciate the ease and simplicity of this dish. I followed your recipe exactly as written and it was bursting with flavor yet so light, just perfect for this hot summer evening. My children said it reminded them of a small restaurant in Washington DC’s Chinatown, a very high compliment for sure.